Hi, I’ve been trying to get an original Hotshot to run with no luck, first couple of attempts the servos moved very slowly but now there’s nothing, the hotshot’s dead. 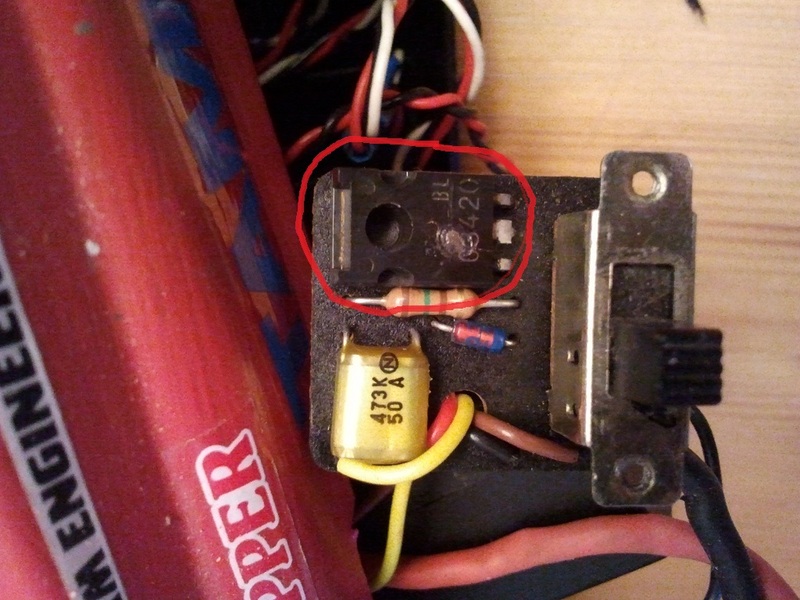 I started checking the electrics and found the component circled in the photo appears to have ‘blown’ so I assume that’s the problem. I’ve been looking on ebay for the switch assembly with no luck. Could anyone here id the component in the photo? I haven’t got a clue! It looks like a BEC-circuit. That is the old style regulator for radios without a BEC circuit built in. it basically took 7.2 or 8.4 volts and took it down to about 5 volts to power old receivers. If your receiver says BEC on the label then you do not need that circuit and you could bypass it and tap directly into the battery. you can confirm your radio is OK by getting 4 AA batteries or a receiver battery and plug it into the battery terminal on the receiver. This would be just to test radio operation. if it works and you have the BEC on the label (old receivers) then bypass that voltage regulator. if you want to restore that regulator you will need to get the part number off the blown part and solder in a new power regulator with similar specs. its hard to read in the photo looks like: BL 03420 but the first part is burnt and can't read it. I would imagine its a 5V 1-3 amp regulator. I'm with tamiyadan , Get the part number & fix it . It's not to hard . BL 03420 or BL 08420 , But i'm sure you can see it better as it does look like it's Bl 03420 .
that regulator blew for a reason. if a servo is bad or you have a short in the radio system that power transistor will keep on blowing up.